This hike begins and ends at Reilly. Start out by following the old water line south to the mouth of Water Canyon. After hiking about a half mile up Water Canyon, turn north onto an old road which heads up a side canyon and follow this road for about three miles. A donkey trail takes off to the east from here and leads to the top of a canyon which can be followed down to Reilly. This hike passes by several sites of historical interest and includes lots of beautiful desert scenery. HIKE DIRECTIONS: Walk over to the remains of the Anthony Mill. From there look south and a little east. The water line should be clearly visible from here and it should be easy to find the end of it. Once on the water line follow it for 2.6 miles. Along the way you will cross a couple roads and pass by some interesting sites. At 0.75 miles the water line crosses a road/wash. At 0.90 miles a pair of roads leading to the Sea Silica Mine are crossed. At about 1.3 miles a road leading up to a mine perched atop a mountain is crossed. At 1.95 miles the road leading to the Whitaker Mine is crossed. The area around the Whitaker Mine is a little rough and several small detours are required, but most of the time it is possible to stay on the water line. At the mouth of Water Canyon (elev. 2450') turn west and walk up the canyon 0.6 miles to a road (elev. 2560') which takes off to the north. A short distance up the road are the remains of a couple of small stone structures. Over the next couple miles many donkey trails and old mining roads are visible as you hike up the road. After hiking a total of 6.1 miles from Reilly (that's 2.9 miles on the road), a donkey trail (elev. 3980') is reached. The donkey trail takes off to the east and follows a ridge for about three-tenths of a mile to a saddle at an elevation of about 4050 feet. From here the donkey trail branches off in three directions. Take the route that drops into the canyon to the northeast. Follow this canyon for 1.7 miles back down to Reilly. 1. Explore Riley - Not only are there the remains of lots of stone structures, but a road leads off to the west to some old mine tunnels. 2. Sea Silica Mine - It just a short hike from the water line to the Sea Silica Mine. There are some old mining apparatuses still there and a lot of white mineral stuff to inspect. 3. Road to Mine - The road up to this mountaintop mine is quite steep and it's over a mile long. Walking down this road is a little tricky in spots due to poor traction. Be careful not to slip and fall! 4. Whittaker Iron Mine - It's just a short hike up the road to this old mining area. 5. 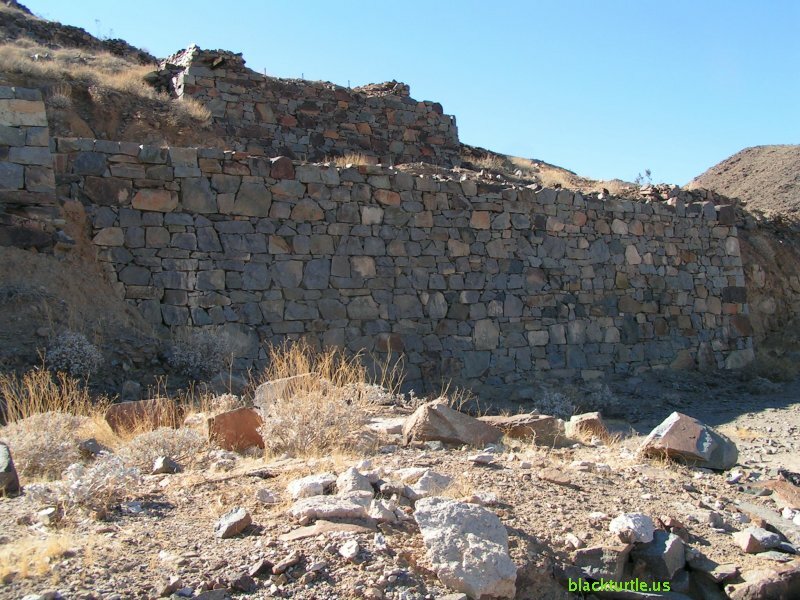 Stone Structures - There are two old stone structures just off the road worth a quick inspection. 6. Road to Shepherd - Continue up the road towards Shepherd Canyon for another mile or so. The road actually connects to a branch of Shepherd Canyon which can be followed down to Shepherd Canyon and on down to a road which leads to Reilly from the north. This would lengthen the loop to over twelve miles. 7. Donkey Trail - From the saddle at the top of the canyon leading down to Reilly, follow the donkey trail due east. It snakes around a mountain and then heads south and then east again to a mountaintop mine. This ridge can be followed to the other mountaintop mine, BTW. 8. There are two alternative trailheads for this hike. The easiest to get to (and the one recommended if your vehicle does not have high clearance) is the mouth of Water Canyon. The second is the "Kitty Litter" sign. To get to this sign, turn onto the dirt road west of the highway which is a half mile south of Nadeau Road, but instead of driving straight north, turn west after less than 100 yards and continue west about three-quarters of a mile to the aforementioned sign which is at a trail junction with the road leading to the mountaintop mine mentioned in Variation #3.